Toni Elias aboard his Suzuki at Road Atlanta. As we wrote earlier, fomer Moto2 champ and MotoGP race winner Toni Elias found immediate success in the MotoAmerica Superbike class despite being drafted at the last minute to replace the injured Jake Lewis at Yoshimura Suzuki Factory Racing. He won both races at the COTA facility in Austin a few weeks ago (a track he was familiar with from his GP days), and then went on to win in the very next MotoAmerica Superbike race held at an unfamiliar venue, Road Atlanta. A DNF in Race 2 at Road Atlanta has Elias one point behind teammate Roger Lee Hayden in the championship heading into this weekend’s New Jersey round. Yoshimura Suzuki Factory Racing has signed Toni Elias for the remainder of the 2016 MotoAmerica season. The former Moto2 world champion created a sensation when he won the first three Superbike races of the season on a Yoshimura Suzuki GSX-R1000 as a fill-in rider for injured Jake Lewis. 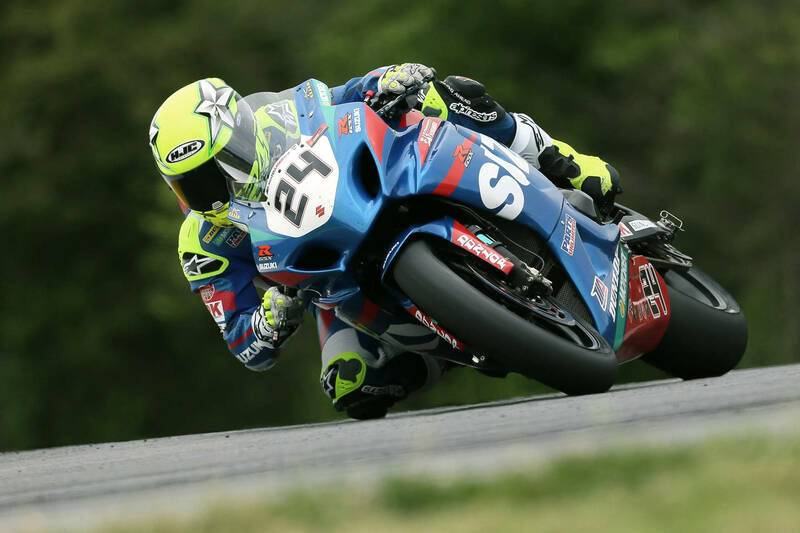 When he returns to competition in two weeks at VIRginia International Raceway, Lewis will move to Team Hammer on an M4 Suzuki GSX-R1000 in the Bazzaz Superstock 1000 class. The transition became possible when Team Hammer rider/owner Chris Ulrich decided to retire from racing. Suzuki recognized the opportunity for Lewis and began a discussion with the team. “Suzuki Motor of America is pleased to have the resources available and the support of our M4 and Yoshimura Suzuki teams to take full advantage of this opportunity,” said Pat Alexander, Suzuki Road Race Manager. “We’re happy to have Toni officially join the team for the rest of the season,” added Don Sakakura, Yoshimura Suzuki Vice President. “Toni has provided a great boost and wants to stay. The logistics were made easier for everyone when we learned Team Hammer had an opening. For Elias, word that he would stay with Yoshimura Suzuki for the 2016 season was welcome news. “I’m very happy for the opportunity to continue racing with Yoshimura Suzuki,” he said. “I’ve gotten to be good friends with everyone on the team and we work together very well. “We’re happy to welcome Jake Lewis to the Team Hammer family,” said Chris Ulrich. “We’ve been interested in Jake for years, and the project fits Team Hammer’s renewed focus on developing talent in the MotoAmerica series. In addition to joining Team Hammer Suzuki, Lewis’s contract with Suzuki has been extended through the 2017 season. “This is a good move for me,” Lewis said. “Obviously it’s been a tough start to this season, but the steps Suzuki are taking work for me because I feel like I can run up front and challenge for wins in the Superstock class. After the first four races of the MotoAmerica Superbike season Yoshimura Suzuki riders Roger Hayden and Elias are first and second in the points standings. Elias made one of the most impressive debuts in AMA Superbike history when he opened his MotoAmerica career with a sweep of the two races at the Circuit of The Americas earlier this month. He followed that up with another victory in race one at Road Atlanta. The 2016 MotoAmerica Championship is at New Jersey Motorsports Park this weekend, April 29 through May 1, in Millville, New Jersey, for the first of two visits this season to the track. The races will be televised on beIN SPORTS. Is Benelli Finally Ready to Deliver New Large Displacement Models? You’d think Suzuki never set up a bike for racing in the rain or left the traction control units at home. They both looked terrible in the rain. Heck, Pegram who hasn’t raced in a year crushed them. Good move overall for Suzuki and for M4 and ulrich getting Jake Lewis. Racing at the non elite level is often distasteful. You get injured, your replaced and return and screwed when the guy does well. Glad I don’t make my living this way..
Good for Toni, sorry to hear Chris is retiring but glad he made a spot for a contender. Chris is good spokesman for the sport. Now to try and find racing on TV without adding to cable bill. Congratulations Toni! Now go and win this thing! We’ll be rooting for you.